Schottlander: The most common explanation for the name Schottlander is for a person who comes from Schottland, as described below. 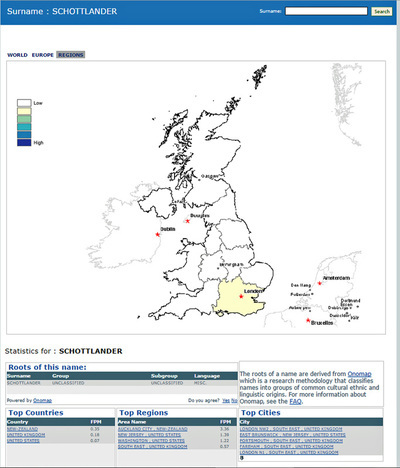 Who first came to be called Schottlander is not known for certain, but most Schottlanders in the world today appear to be Ashkenazac Jews (from census and birth records), and "our" Schottlanders have more than 5,000 blood relatives in Geni, all who also have Jewish names. Between 1790 and 1810 all Jews in Prussia were required by law to take a surname, rather than the patronymic names they had used for centuries (e.g. David, son of Jacob). The 20 odd families in the Jewish synagogue in Alt Schottland, some connected biologically, all decided to take the name Schottlaender. 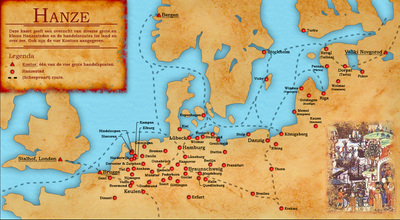 By 1815 or thereabouts, all the Schottlander Jewish families had dispersed to other cities and other countries. So – why did the Schottlanders all leave Alt-Schottland? ​We note that Danzig, Poland became part of Prussia in 1793 and subsequently lost its importance as a trading port to the larger German ports of Hamburg and Kiel. This probably caused a major redistribution of traders moving to other trade locations within the Prussian empire, including locations in Latvia, Breslau (now known as Wrocław, Poland), etc. Exacerbating this redistribution of population were the Siege of Danzig in 1807 (when 27,000 French Napoleonic troops encircled the city and captured Danzig) and the Siege of Danzig in 1813 (which lasted for almost a year as Russian and Prussian troops attacked the French garrison, which had been augmented by remnants of the Grand Armee of Napoleon retreating from Russia). A well written family origins document prepared by Lars Menk, an acknowledged genealogy expert on the Schottlaender family history, follows at the end of this section. We also need to be aware that in the context of this Family History, the term Jewish refers to race and not necessarily religion; in fact, there are indications this Schottlander family was mixed religion, with several of the daughters marrying Protestants, and in fact Mathilde Schottlaender, born 1849 to our first William Edward Schottlander (1813 - 1871), married the son of the Honourable and Reverend Rector Albert Schmidt of Frankfurt on Oder. Last but not least, some of Germany's birth & baptism records have been transcribed and digitized, mainly in heavily populated Western Germany areas, but most still have to be researched at the Parish church level. Many of the Schottlander family names in the Berlin and Brandenburg Gate regions also record their tragic deaths in the 1940s as victims of the Holocaust, it didn't matter if some had been Protestant for several generations. The Hanseatic League (also known as the Hansa) was an alliance of trading guilds that established and maintained a trade monopoly along the coast of Northern Europe, from the Baltic to the North Sea, during the Late Middle Ages and Early modern period (circa thirteenth–seventeenth centuries). Rival cities cooperated within the League to defend themselves from pirates as well as to compete against larger economic powers. For almost four centuries, the League maintained its own military, an exchange mechanism, regulated tariffs and even had a Parliament (Diet, the Hansetage), although this met infrequently. The lack of customs borders on the River Vistula after 1466 helped to gradually increase Polish grain export, transported to the sea down the Vistula, from 10,000 tonnes per year in the late fifteenth century to over 200,000 tonnes in the seventeenth century. 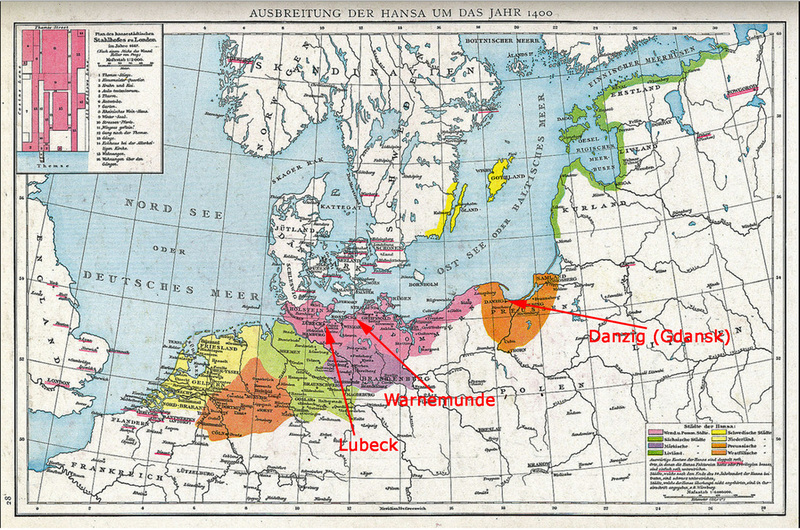 The Hansa-dominated maritime grain trade made Poland one of the main areas of its activity, helping Danzig to become the Hansa's largest city due to its control of Polish grain exports. 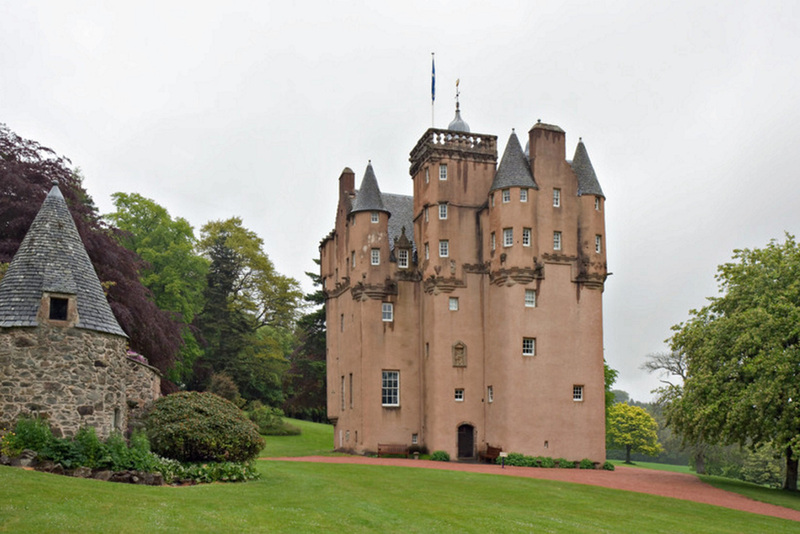 Since the late 14th century the Baltic region enjoyed strong trade links with Scotland, and recent evidence has confirmed that many of the timbers used in the building of Queen Mary’s House in St Andrews were shipped from the Gdańsk region some 600 years ago. 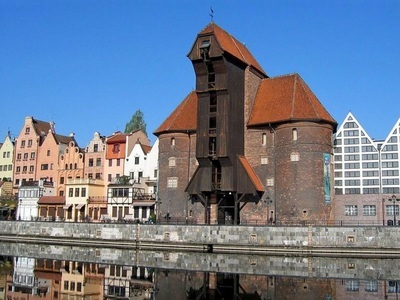 Religious tolerance, an escape from poverty and famine, and the promise of adventure and riches prompted many Scots to seek a future in the Gdańsk region. 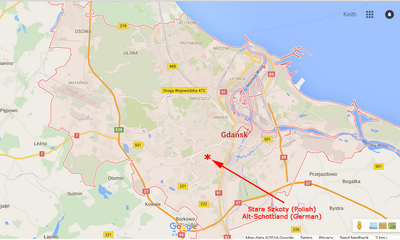 By the 17th century the Danzig (Gdańsk) area was home to an estimated 30,000 Scots, many of whom settled in a new suburb that became known as Alt-Schottland. To this day, the local Kashubian word for a business traveller is ‘szot’. 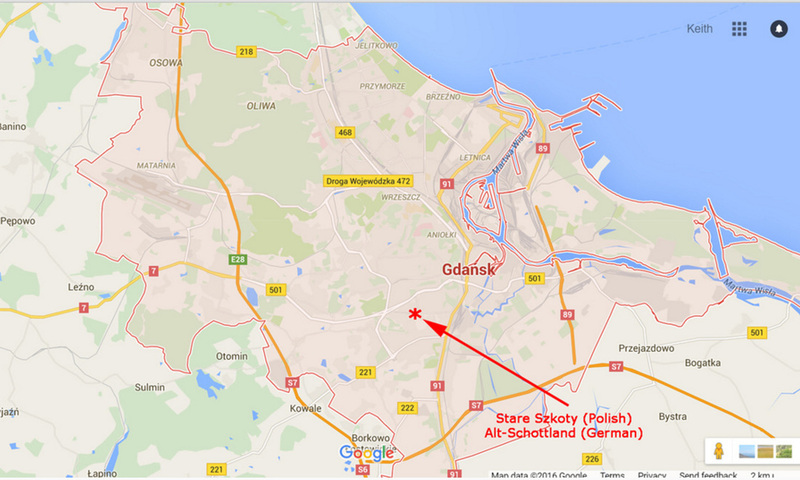 Others joined military factions, and Danzig was the first town in Poland to have a regiment of Scottish mercenaries. In the earliest period of its history, from about the 10th century to the 15th century, Danzig proper had no Jewish community and allowed no Jewish settlement whatsoever. The rulers of adjoining territories, however, did grant trading rights to foreign merchants, including Jews. These areas became the suburbs of Alt-Schottland and Hoppenbruch. 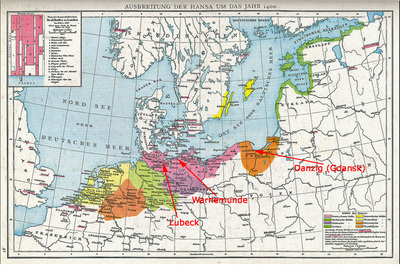 Although Danzig remained closed to Jewish settlement, a modest number of Jewish families did settle in the surrounding suburbs. By the 18th century, there existed organized communities in Alt-Schottland and Weinberg, which employed rabbis and other functionaries, built a hospital and ritual bath, and provided for the poor. Jewish surnames (Wikipedia); Jews have historically used Hebrew patronymic names. In the Jewish patronymic system the first name is followed by either ben- or bat- ("son of" and "daughter of," respectively), and then the father's name. (Bar-, "son of" in Aramaic, is also seen). Permanent family surnames exist today but only gained popularity among Sephardic Jews in Iberia and elsewhere as early as the 10th or 11th century and did not spread widely to the Ashkenazac Jews of Germany or Eastern Europe until the 18th and 19th century, where the adoption of German surnames was imposed in exchange for Jewish emancipation. Although Ashkenazi Jews now use European or modern-Hebrew surnames for everyday life, the Hebrew patronymic form is still used in Jewish religious and cultural life. It is used in synagogue and in documents in Jewish law such as the ketubah (marriage contract). The history of a people; ​Located on the cross roads of ancient trade routes, this region suggests that the Yiddish language was developed by Iranian and Ashkenazic Jews as they traded on the Silk Road from the first centuries AD to around the 9th century when they arrived in Slavic lands. Three major cities of the Hanseatic League, Lubeck the oldest and wealthiest, Danzig the largest. This wonderful memoir describes the history of the Schottlaender family in Muensterberg, Silesia; these are descendants of Israel David Schottlaender, and direct relatives of the newly discovered Schottlander and Shotlander family members in Ontario, Canada. Th Download file shown below is an 8 Generations descendants fan chart, each generation is shown in a different color - this is a pdf file which can be increased in size.